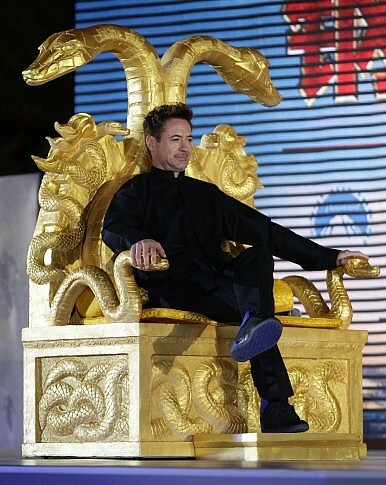 Robert Downey Jr. during a promotional tour for "Iron Man 3" in China. Hollywood in China: Selling Out or Cashing In? Are Hollywood filmmakers really selling out to China — and Chinese censorship? China’s film market, growing by around 35 percent a year, is now the second largest in the world, with expectations that it will surpass the flat North American market (the U.S. and Canada) within three years. Indeed, in February 2015, during the lucrative Lunar New Year holiday when Hollywood and other foreign films are routinely barred from distribution, China’s monthly box office earnings for the first time surpassed those of the United States. Moreover, new milestones continue to be set. For example, Fast and Furious 7, which taps into middle class obsessions with owning a car, took in 391 million RMB ($63.1 million) on its opening day on April 12, 2015, almost doubling the previous record of Transformers 4: Age of Extinction, which took in 194.8 million RMB on June 27, 2014. Furious 7 just ended its run by taking in more than $390 million, smashing the previous record of $320 million set by Transformers 4 in 2014. And the hits just keep on coming. Avengers: Age of Ultron replaced Furious 7 at the top of the box-office charts in China, taking a massive $150 million in its first six days, constituting 87 percent of all box office receipts for the week. For such expensive tentpole films, which routinely now bring in a worldwide total of over $1 billion, the China market has become as important as the domestic North American market, with Furious 7 and Transformers 4 faring even better in China than at home. Hollywood’s success in the China market, where it has taken between 43.5 percent and 51.5 percent of the box office every year since 2009, is even more impressive since quotas restricted foreign revenue-sharing films to 20 per year prior to 2012, and 34 films a year since then. That limit comes on top of various administrative measures enacted by the Chinese government to try and ensure that domestic films gain at least 50 percent of the market. Such success has fueled widespread criticism that the quest for market share has compelled Hollywood to “sell out,” to self-censor in making films that, at best, avoid sensitive social and political issues, and at worst offer an overly positive picture of China under Communist rule. For anyone familiar with the history and goals of Hollywood, it should not be surprising that films intended for overseas markets are tailored to suit the demands of those markets. Hollywood has always been concerned with the bottom line, so the reaction to the astonishing rise of the China market represents business as usual. It is this flexibility and ability to adjust that has been a major contributor to its long-term success. In this regard, it is instructive to compare Hollywood’s strategy to China’s efforts to promote its soft power by succeeding on the international film market. Ren Zhonglun, president of the state-run Shanghai Film Group, noted the aspirations of the Chinese film industry when he told a Western reporter, “We want to learn how to make movies that appeal to a global audience.” Indeed, that was one of the motives when China finally agreed, in 1994, to allow Warner Bros.’ The Fugitive to become the first Hollywood film into the country on a revenue-sharing basis. Chinese officials have openly stated that the Chinese film industry is facing a war with Hollywood. However, Chinese success is inherently limited because in China, unlike Hollywood, film is expected to perform several contradictory functions simultaneously. For example, in discussing the film industry, Politburo member and director of the Propaganda (Publicity) Department of the Central Committee of the CCP Liu Qibao has praised the success of Chinese films in the domestic market and noted that China should also become an international movie power, but at the same time he has called for the country’s films to take “socialist core values as a guide” and “contain more elements of the Chinese Dream.” Liu’s comments may appeal to Xi Jinping and his colleagues on the Politburo, but they reflect a lack of knowledge of audience preferences. This introduction of politically correct requirements virtually guarantees a result counterproductive to state intentions. By contrast, Hollywood makes “high concept” films that are meant to have universal appeal, across all cultures, with profit virtually its only motive. Moreover, in selling the American Dream, Hollywood has a far easier task than China’s attempt to sell the state-mandated Chinese Dream. Unlike the Chinese Dream, which emphasizes the glory of the nation and the linkage between individual goals and collective goals, the American Dream stresses individual prosperity, success, and a rise in social status, all of which come through in many Hollywood films. Ironically, given the Chinese state’s emphasis on the superiority of Chinese culture in promoting its own Dream, the American Dream actually “sells” better even within China. Indeed, some of the most popular Chinese films at home have been largely about the American Dream – such as Finding Mr. Right (Beijing yu shang xiyatu) – or have been imitations of successful American films about individual success told solely in materialistic terms, as in the Tiny Times (xiao shidai) franchise. Some Hollywood films have been quite obvious in flattering China, as in 2012, when Oliver Platt praises China for being able to build the arks to leave the doomed Earth in a very short time (“Leave it to the Chinese; I didn’t think it was possible, not in the time we had”). Even there, at least some Chinese netizens found the scene to be critical of China, implying that only China had such an authoritarian system they could order their people to build the arks so quickly. Other films, such as Looper, have additional scenes intended only for the China market that do not appear in the international version. In this regard, Hollywood has always been careful to put the burgeoning Chinese market in perspective. Blockbusters such as Iron Man 3 or Transformers 4, which started out as likely co-productions with China, in the end were able to gain most of the benefits of co-production status without saddling themselves with the type of Chinese cultural content or Chinese actors in major roles that would have been required for co-production status, but would also have limited the film’s appeal in other markets. In addition, appeals to the Chinese market are often far more subtle, at least to a non-Chinese audience, and represent product placement more than pandering to Chinese authorities. Moreover, these insertions are not even intended to be understood by non-Chinese audiences. Early in Transformers 4, for example, Mark Wahlberg sends a drone to retrieve money from an ATM in Texas. The debit card in the scene is from the Chinese Construction Bank and Chinese audiences will be able to note that immediately. But the image flies by so quickly that non-Chinese audiences may not even notice there are Chinese characters on the card. In the same film, when Stanley Tucci is seen in Hong Kong drinking from a milk carton with Chinese characters, Chinese audiences will recognize the obvious plug for a well-known Chinese company, but foreign audiences are likely merely to assume that he’s in Hong Kong, so it’s not surprising that the product has Chinese characters. As the Hollywood and Chinese film industries become more closely interwoven, with major new deals seemingly being signed on a weekly basis, Hollywood has been shrewd in establishing partnerships that will help to promote its products in the Chinese market. For example, the state-owned China Film Group has a reported stake of around 10 percent in for Furious 7, so they had a strong financial incentive in ensuring that the film got maximum distribution in Chinese theaters, where it opened on 5,454 screens. Hollywood is also taking advantage of the Chinese desire to learn “the business,” and many of the partnerships provide much needed pre-financing for American films, as well as helping to ensure distribution within China. While it is not the same as the kind of “dumb money” that Hollywood seeks and often attracts from those overseas and domestic investors who want to be part of the glamor associated with the industry, such partnerships with China, at least to this point, do very little to promote Chinese films in Western markets, one of the primary aims the Chinese government has for its film industry. Finally, Hollywood films have indeed been altered to make sure there are no Chinese villains. The classic example is the remake of Red Dawn, where the enemy was changed in post-production from China to North Korea, but more recently in Iron Man 3, “The Mandarin” from Marvel Comics, Chinese-born and one of the greatest comic book villains of all time, was transformed into a Western actor simply hired to play a role by the real villains. But in the aftermath of the Sony hacking scandal associated with The Interview, Hollywood has virtually run out of countries to demonize and offend. Increasingly, evildoers are likely to be unnamed multinational corporations, media conglomerates, stateless terrorists of various stripes, or even rogue elements within the U.S. government, with villains representing threats to all countries, perhaps bringing us full circle to some early James Bond films. Stanley Rosen is a political science professor at the University of Southern California, specializing in Chinese politics and society.